Grilled corn on the cob is a delicious summer time treat. Have you tried it? If not let me show your taste buds the way. My recipe has nice kick to it with the addition of a chipotle, maple, orange sauce. A perfect side dish to your next Mexican food party or any BBQ that needs spicing up or a change of pace. If you’ve looked around, you have probably heard of several ways to grill fresh corn on the barbeque. Some people shuck the corn completely (meaning they remove all the outer leaves and silk) and then wrap the corn in foil. Other methods say to soak the corn in its’ husks in water anywhere from 5 minutes to 4 hours. Still others recommend pulling the husks back (but keep the husks attached at the base) to remove the silk and then cover the corn back up with the leaves and tying the end closed. I think all the above ways work fine but I like pulling the husks back from the corn being careful not to remove them entirely. Then pull off the silk and then pull the husk back up over the corn and tie it closed with a piece of husk. Lay the ears right on a preheated medium high grill. Nice, simple and I always end up with juicy, tender, and sweet corn on the cob. The husks protect the corn from drying out and becoming chewy and they help give the corn a subtle smokey flavor. Some people like to just add butter to their corn. Nothing wrong with that. In fact for your next party, you can season your roasted corn in a variety of ways so that you can please just about anyone, from kids to those who really like it spicy hot. So try out my chipotle maple orange sauce. I think you are going to like it. Remember, it all starts with a great sauce. So let’s get on to our corn on the cob recipe. Preheat your BBQ to medium high or prepare coals. Pull the husks back from the corn and remove the silk. Recover the corn with the husk and tie it closed with a thin piece of husk. Grill corn for 10 to 15 minutes, turning every couple of minutes. The corn husks will become charred with grill marks and that’s okay. Don’t worry the corn won’t burn. Keep in mind you can adjust the “heat” in the sauce by varying the amount of chipotle chile you add. Slice open the chipotle chile and remove the seeds with a knife. If you want just a little zip to your sauce, start out with just a teaspoon of this minced pepper. Taste it and add more if desired. Add all the ingredients except the yogurt to a sauce pan over very low heat and stir well. Cook for 5 minutes and remove from heat. Add the yogurt and stir well. Keep warm until ready to serve. Remove the corn from the grill and let it sit for 5 minutes to cool. Remove the husks and place on serving platter. Brush corn with chipotle sauce and serve immediately. 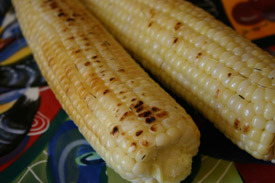 Mexican grilled corn goes beautifully with chicken enchiladas, refried beans and spanish rice. Looking for more roasted vegetables? Try our delicious roasted vegetable recipe and our Honey-Lime Sweet Potatoes.